The Migrant and Seasonal Agricultural Worker Protection Act is a miscellaneous law poster by the Federal Department Of Labor. 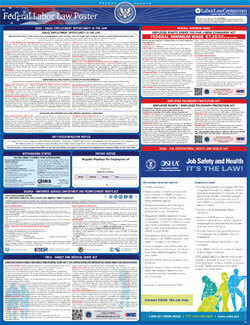 This poster is mandatory for some employers, including agricultural employers, agricultural associations and farm labor contractors. This poster, that is in both English and Spanish, must be posted in a conspicuous place for those who are agricultural workers to see. This poster describes the rights that farmworkers have as well as what to do and where to go should they have their rights violated." It appears you don't have a PDF plugin for this browser. Please see the link below to download federal-mspaensp.pdf. contr actors are required to register with the U .S. emplo yees can readily see it. División de Salar ios y Horas La ley exige que los patrones fijen este a viso en un lugar donde puedan verlo fácilmente los tr abajadores .